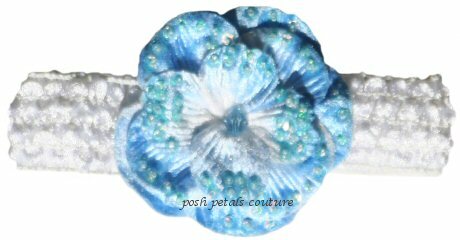 Our "Sophia" flower has crushed velvet petals that are embellished with small glistening beads. It measures approx 3 1/4 inches and is fastened to a crochet headband 3-4 cm wide. The headband is "one size fits all", keeps it's elasticity and is soft and comfortable on the head.